This expansive 4 BD, 3/1 BA traditional home features neutral dcor, gleaming wood floors, many updates, and a flexible floor plan. 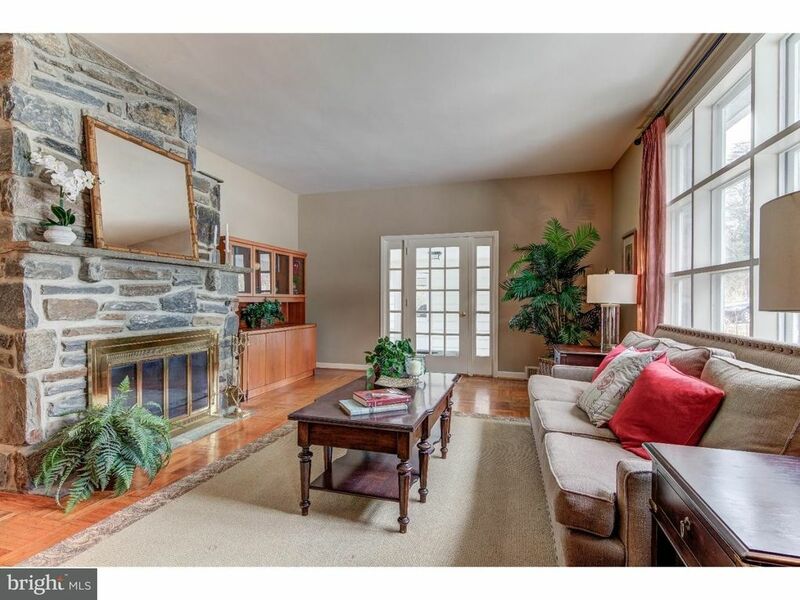 An unusually large and open Entrance Room greets visitors to this stone & siding colonial. Beautifully sized for entertaining, this spacious room has open views of the Living Room and the Dining Room and could even accommodate a desk area. Nearby is the renovated Kitchen with vaulted ceilings, granite counters, an island with barstool seating, and a casual breakfast area rimmed with large windows. The Living Room has a stunning floor-to-ceiling stone fireplace, large picture windows, tall ceiling heights, and doors to the covered Breezeway. The formal Dining Room has newer doors to the large rear deck. Just a few steps up from the Entrance Room is the large Family Room with Laundry area and separate storage closet, plus there are several more closets and a full Hall Bathroom in the adjacent hallway. The downstairs Master Bedroom suite has a walk-in closet and a beautifully renovated, spa-like Master Bathroom with large tub, separate frameless glass-enclosed shower, and a granite-countered vanity. Upstairs are 3 more Bedrooms, including one which is so large that it could be divided to create four upstairs bedrooms, or an upstairs Master Bedroom suite. An updated 3rd full Hall Bathroom and a cedar closet complete this level. Downstairs is a bright & cheerful 2nd Family Room with large windows and a door that leads to the rear yard, plus a newer Powder Room, Bonus Room, Storage/Utility Room, and more. A large deck is accessed from the Kitchen and the Dining Room, and overlooks the scenic 1++ acre yard. A covered breezeway connects the 2-car garage to the Kitchen and Living Room. Thoughtfully updated over the years, this energy-efficient home features geothermal heat, central A/C, and natural gas cooking. Located on a quiet street with no thru traffic in sought-after Radnor Township, this property is near the shops, restaurants, hospital, and train station in downtown Bryn Mawr, and is convenient to the Blue Route, Airport, and Center City.